In 2013, the Pakistan Air Force (PAF) Sea Survival School (SSS) purchased two 4-passenger Neoteric Rescue Hovercraft for security patrol along the Korangi Creek Air Force Base shoreline in Karachi, Pakistan. The curved shoreline contains mudflats and mangroves that make it inaccessible to vehicles other than hovercraft. Wabash River in Terre Haute, IN. At the time of purchase, the PAF’s budget did not allow for their hovercraft to be equipped for saltwater operation, or for flight training and maintenance instruction. Due to this lack of training – which includes teaching the additional maintenance procedures required when a hovercraft is not equipped for saltwater operation – both of the PAF’s hovercraft suffered deterioration. 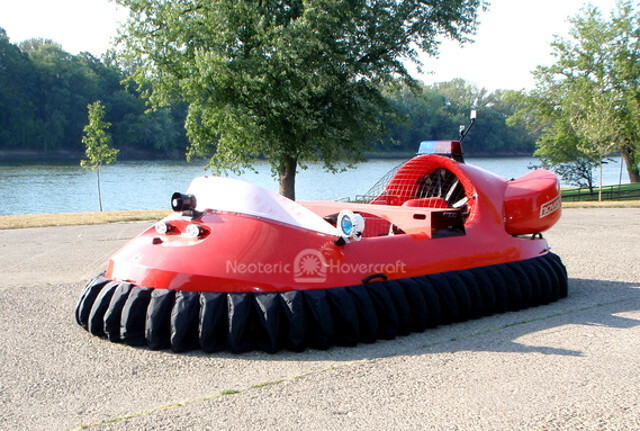 Fortunately, both Hovercraft Training Centers and Neoteric Hovercraft, Inc. offer dedicated customer service. 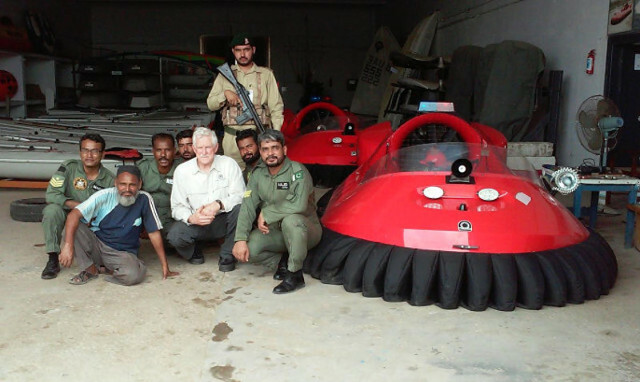 Chris Fitzgerald, HTC Senior Instructor and Neoteric President, traveled to Pakistan for a week to conduct maintenance instruction, to provide onsite flight training, and to assist in upgrading both Air Force hovercraft for saltwater operations. The work was done at the PAF Sea Survival School, under the command of Squadron Leader Raza Khan, the Commanding Officer of the SSS. Wing Commander Mahmood traveled from Islamabad to review the training program. 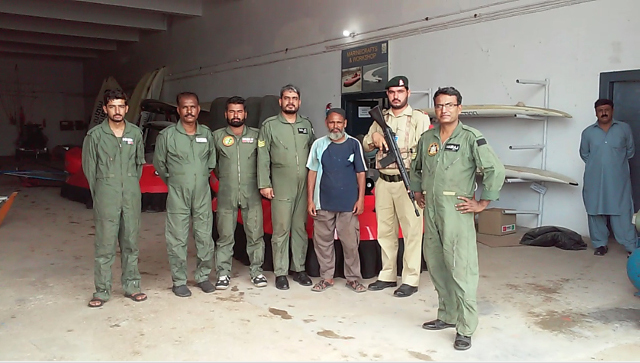 The following personnel were involved in the restoration of the two hovercraft: Squadron Leader Raza Khan; Senior Technician Mahid (electronics & weapons); Chief Technician Mairaj (ground transport engines); HS-1 Rashid (electrical); Skilled TM Wagar (student fitter); HS-2 Iqbal (painter); Skilled TM Najam (maintenance) and Chief Technician Farooq (road transportation driver). Skilled TM Najam and Senior Technician Majid. while assisting in upgrading the two rescue hovercraft for saltwater operation. Security Guard, Chief Technician Mairij, and a visitor on the far right. The primary role of the Pakistan Air Force Sea Survival School is to train fighter pilots in “survival at sea.” In addition to their two hovercraft, the SSS also operates several fleets of sailboats, windsurfing boards, motor launches, jet skis and inflatable dinghies for rescue missions, training and for the PAF’s participation in national and international competitions. In addition, Pakistan and surrounding nations rely heavily on the PAF for tsunami, cyclone, earthquake and flood rescue operations. 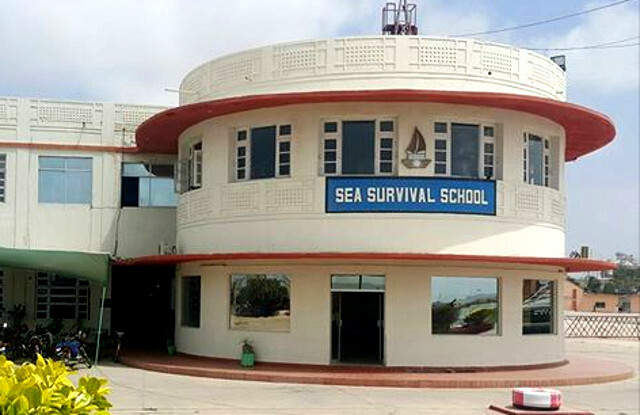 The Pakistan Air Force Sea Survival School in Karachi, Pakistan. 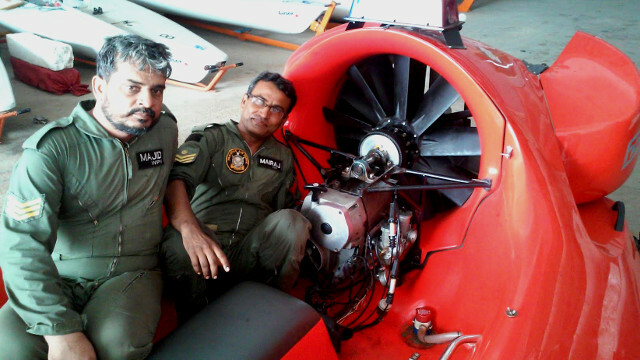 Due to the omission of flight and maintenance training when the Pakistan Air Force purchased their two hovercraft in 2013, the craft suffered enough damage that their refurbishment, and maintenance training to personnel, took longer than anticipated. This left insufficient time for flight training. Chris Fitzgerald was able to give preliminary pilot training only to Commander Raza and Chief Technician Mairij. But this can be rectified by additional flight training either onsite in Pakistan or at Hovercraft Training Centers in the U.S.
Make no mistake: a hovercraft is a flying machine. You don’t drive it - you fly it 9 inches above the surface. Just as you wouldn’t jump into a helicopter and take off without proper flight training, neither should you do so with a hovercraft. possession of their new rescue hovercraft at the Neoteric factory. Capt. 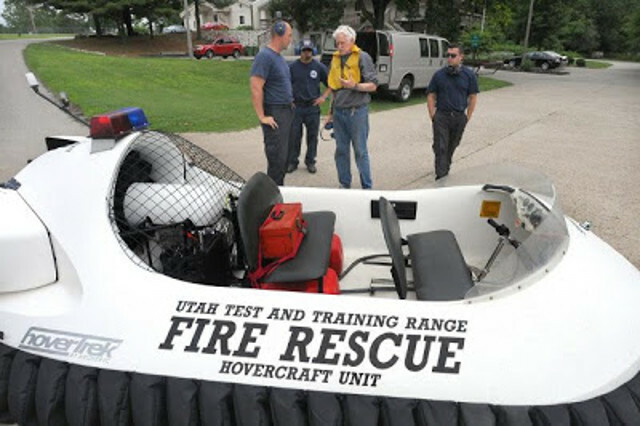 Lingelbach enrolled in Hovercraft Training Centers’ Advanced Training Course, which includes hard access, fast-flowing water rescue and nighttime operational training. For he and his team, learning how to operate a hovercraft properly has not only proven to boost the safety of their rescues, but it has also dramatically improved their response times. The UTTR Air Force rescue team has reduced its recovery time from an average of two hours with ATVs to just 20 minutes with hovercraft. Then take a Test Flight to see for yourselves.